“I say Linda, you say Vista! … I say Food, you say Day” was the cheer that Kate McDevitt used to rally 150 excited 4th and 5th graders around our topic for the day: Real Food. Kate works for the Network for Healthy California and she was instrumental in organizing a fantastic series of Food Day celebrations in San Diego. I started the day by assisting with Linda Vista Elementary’s Breakfast in the Classroom program. After packing rolling coolers full of bananas and milk, I headed with a group of student “breakfast deputies” to their classroom for a quick glimpse into this school-wide feeding program. A quick meal of an egg & cheese flauta, a banana & milk and we were off to the auditorium for a School Food Tour presentation. The kiddos were a great audience and were extremely enthusiastic to ask questions and participate at every opportunity. We could have done Q&A for hours! 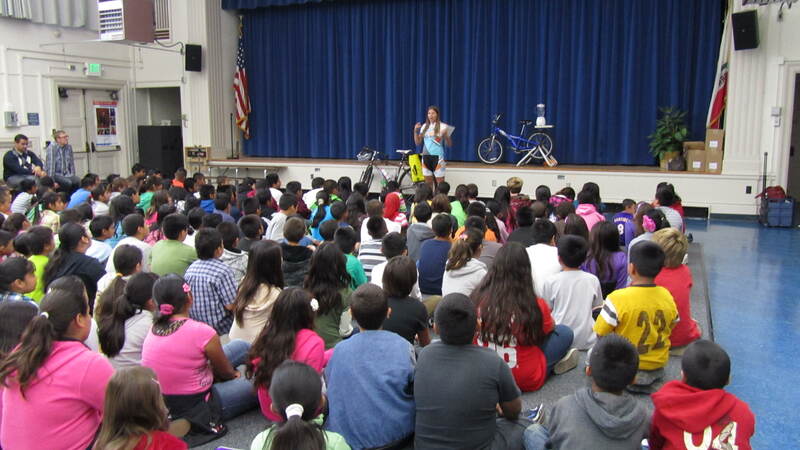 Next we were off to Montgomery Middle School where a smoothie bike demo was set up in the cafeteria. After a quick class presentation the students sampled smoothies, ate a quick salad and then headed out to the garden for some planting. 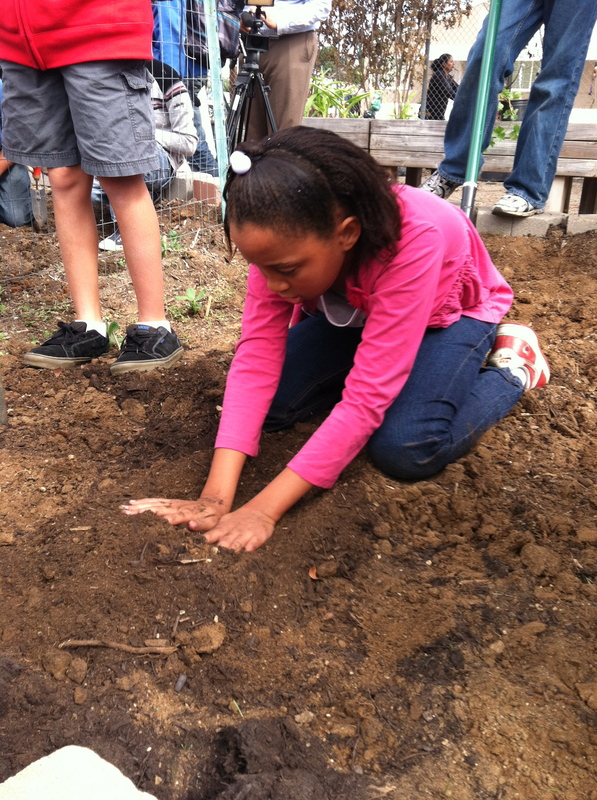 Farmer Dave brought along some plants and the students set to work preparing beds, digging, and searching for grub worms. A booth at the Linda Vista farmer’s market was the next agenda item for the day. 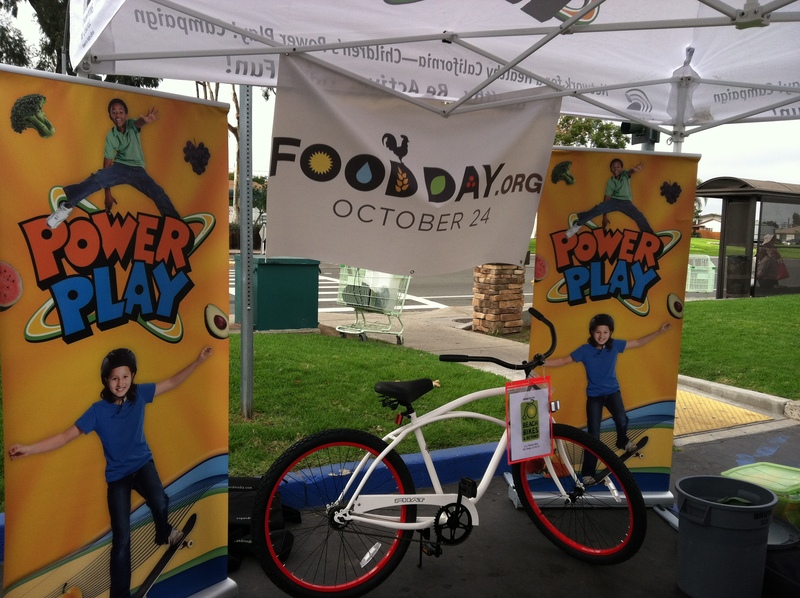 We again had the smoothie bike set up so shoppers could pedal their way to a healthy, fresh snack. The folks from Network for Healthy California secured two bikes to give away – raffle tickets for which could only be procured through a conversation about healthy food and the School Food Tour. As two extremely happy attendees wheeled their shiny new bikes through the stalls of fruit and veggies we packed up our display and were off to the final event of the day. It was a fabulous day filled with positive energy and lots of food-related events. Kudos and THANK YOU to Kate & the rest of the planning team for all of your hard work on the SFT San Diego. Keep the enthusiasm alive!